Rina's Rainbow: F1 Hotel's Weekend Summer Bash Promo! With Aqua Zumba Class and More! F1 Hotel's Weekend Summer Bash Promo! With Aqua Zumba Class and More! Zumba is more tiring than meets the eye. I've watched people do Zumba before and I thought it looked fun but at that time it didn't seem like it was drastically tiring compared to other exercises like Shaun-T's Insanity (Now that one's really insane!) Anyway, when me and my sister tried it at home, I was proved wrong. After a few minutes of doing it, I was sweating like a pig already. Thanks to F1 Hotel that we were able to be the first ones to go on a trial Aqua Zumba® lesson. It was interesting! The coach instructed from the side of the pool, not in the pool with us. This way we could see the hand and feet movements clearly as we do them underwater. The water level ideally has to be on your chest. So you can do the arm movements under water, creating resistance as you do these against the water. It's a low-impact but high-energy workout that I'm sure anyone can do. The pool above is just one of F1's 3 swimming pools. This one is the middle-sized one perfect for bigger kids and adults. The deep end is not too deep. So this was a perfect setting to do an Aqua Zumba class! I have to admit I felt kind of trashy being beside the gorgeous and super nice Wushu expert / model Janice Hung hahaha! But it was fun nonetheless! We can do this! I was also happy that Eric of EricJaz Foodies was also game! We did the exercise for 45 minutes. And while it was quite tiring, it was refreshing even on a hot day because we were in the cool pool of F1 Hotel! You too can avail of this fun Aqua Zumba® class when you avail of F1 Hotel's Weekend Summer Bash room package! For only Php 6,250 nett per night. And with this, you get an overnight stay in a City Suite, including buffet breakfast for 2 at F All Day Dining Restaurant, and of course Aqua Zumba® classes for 2! You make the most out of your stay as well as you will of course be given complimentary passes to the hotel's facilities such as the swimming pool. All three of them of course. There's the kiddie pool, the medium pool, and the lap pool. Here's Rain having a blast at the kiddie pool while I bust out my moves at the Aqua Zumba. With their Summer weekend promo, you will also have access to the hotel gym, unlimited WiFi access. Plus, you get complimentary parking, and last but not the least, to give you more than enough time to really enjoy your stay, you will be given a late check-out at 4pm! Take note that schedule for Aqua Zumba® classes are every Saturdays and Sundays at the pool area from 4:00 PM to 4:45 only. To see more about F1 Hotel, check out my first F1 Hotel here! 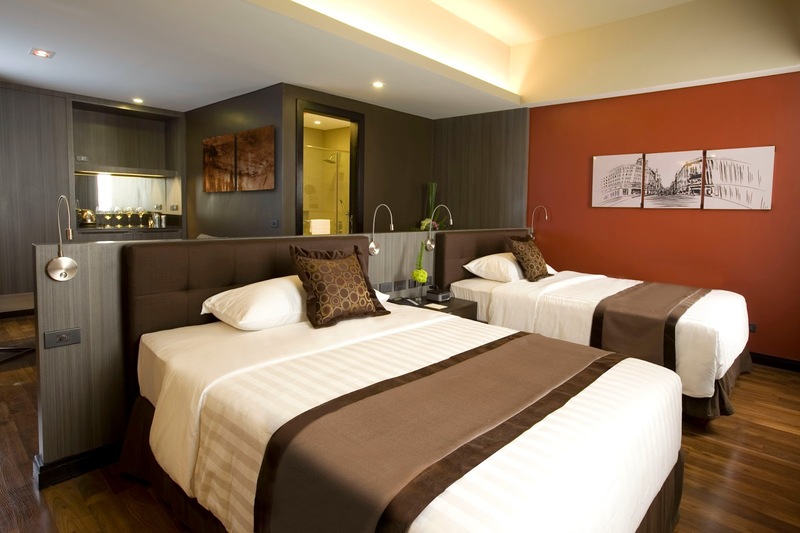 F1 Hotel Manila is located at 32nd street, Bonifacio Global City, Taguig City. For more information or to make reservations, please call (02) 928-9888. Visit their official website at www.f1hotelmanila.com and follow them on Facebook, Twitter and Instagram @f1hotelmanila to get updates on their upcoming and ongoing promotions! To help you show up with the group in fake watches all the chain result of that sit back and watch as a result of the nation's approach, to style, to help you formation, and even every in-between is required to be undertaken on Europe, this includes the nation's top comparability, undertaken via the Federation belonging to the hublot replica uk. Thorough 6-pack abs, add via the sit back and watch helping to make suppliers, has generated an important new release when rolex replica sale practice in inborn worthwhile in the "Swiss made" brand. Whilst unique high-status brandnames canine during the area everyday, not everybody contains directed any specific system of the get the job done to help you all other component to universe. Wedding ceremony expensive and even advanced advertise in running watches contains enlarged all through the society, additionally, the rolex replica uk can be looking at a difficult competitiveness as a result of rivals after only Eu and the simply because these in the usa, ones own unique sewing, national infrastructure, ones own associate through pattern, appearance and even guts to point out to from contains preserved them all on the whole world, with the replica watches uk helping to make trade.